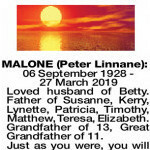 The Funeral Mass for Mr Peter Malone of Salter Point will be celebrated in St Pius X (Manning), Cnr Ley and Paterson Sts, Manning commencing at 10am on FRIDAY (5.4.19). 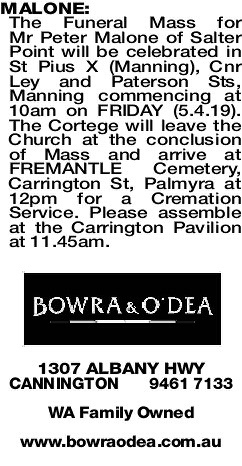 The Cortege will leave the Church at the conclusion of Mass and arrive at FREMANTLE Cemetery, Carrington St, Palmyra at 12pm for a Cremation Service. Please assemble at the Carrington Pavilion at 11.45am. 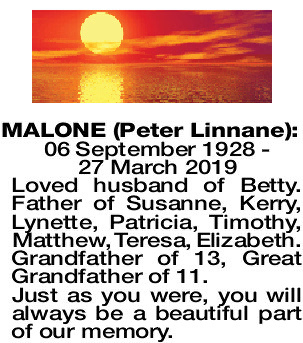 MALONE PETER LINNANE 06 September 1928 - 27 March 2019 Loved husband of Betty. Father of Susanne, Kerry, Lynette, Patricia, Timothy, Matthew, Teresa, Elizabeth. Grandfather of 13, Great Grandfather of 11. Just as you were, you will always be a beautiful part of our memory. 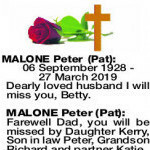 06 September 1928 - 27 March 2019 Dearly loved husband I will miss you, Betty. 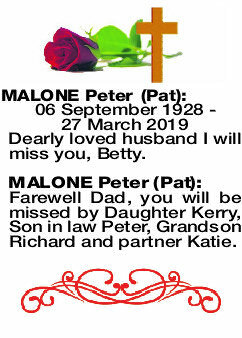 Farewell Dad, you will be missed by Daughter Kerry, Son in law Peter, Grandson Richard and partner Katie.